In the last two weeks, maybe even three weeks, I’ve only read one book. That’s seriously unheard of for me. I can usually devour at least 3 books a week. So you can imagine, and I’ve said it before, my Goodreads challenge is desperately lagging behind. I’m pretty positive I’m going to fail it this year. It doesn’t help that I’d made it my mission to only read books I’ve never read before. Do you know how hard it is to not do a reread when the books are literally staring at you on your shelf?? Suffice to say, I’m never going to do that again and next year’s challenge will be filled with ALL KINDS of rereads. Plus, since I’ve gotten in the habit of leaving reviews on Goodreads, I figure I should probably go back and review the 400 or however many books I’ve read again… eventually. There’s still quite a bit of books I’ve read that are missing from my read list — like Harry Potter for example. Anyway, I digress. Yes. I am OBSESSED with this show. I mean, I love period dramas. I gravitate towards period dramas. I was telling my favorite monkey (orangutanlibrarian) the other day all the shows that I like to watch. Merlin, Robin Hood, Vikings, The Last Kingdom, Frontier, The Three Musketeers — I adore period dramas! Before starting Poldark, I’d watch Victoria which is also a PBS Masterpiece show (or BBC depending on where you live) and I quite enjoyed Victoria as well. Stephanie @ Stephanie’s Novel Fiction recommended this show to me a while back and since I wasn’t really in a reading mood, I decided to give it a try. I seriously wasn’t prepared! The story goes like this. 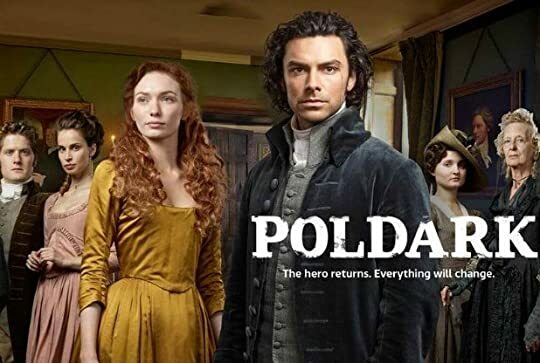 Ross Poldark (man in the middle) goes off to war leaving the woman he loves behind but promises to marry her when he comes back. Three years pass and none of the Poldark family has received word if Ross is still dead or alive. Well one day, he shows up on the doorstep looking to pick his life up where he left it only everything’s change. Elizabeth (second from the left), is happy that Ross is home but she’s no longer to be wed to him. She’s actually engaged to marry Ross’ brother Francis (first on the left) and basically crushes all of Ross’ hopes and dreams because Elizabeth was the reason he kept going in the war; she was his reason to live. Now, he tries to convince Elizabeth what would be best for both of him but their Uncle, Great Aunt (first from the right), and even Elizabeth’s mom basically convince Elizabeth to let Ross go and move on with her life cause Francis is to inherit the estate and has money etc etc. Ross leaves and goes back to his father’s tiny house and decides to make a living for himself and I think in the beginning he was secretly hoping to gain Elizabeth’s favor before the marriage was final but then the Uncle upped the date and really he had no choice to let her go but that didn’t prevent him from flirting! Honestly, he loves his brother but when it comes to a woman, men just get really stupid. Enter Demelza (yellow dress). Ross meets Demelza in a very unconventional way. She’s really beautiful in this picture but when she was introduced, she was this skin and bones girl, often mistaken for a boy, trying to jump in and save her dog from being thrown into a dog fight. Ross saves her thinking he’s saving a boy but finds out he’s actually a she who’s regularly beaten by her father. Ross gets it in his head that he needs a scullery maid so he takes Demelza on at his broken down house in the hopes that she will help the other two servants fix it up and bring it back to rights so he can focus on making a living and a name for himself in the mining business. Copper is the name of the game and it’s a race between being penniless and starving and being wealthy if you can get a plentiful copper mine. Demelza is one scrappy girl. She can’t read but she’s got a mouth on her! She’s not afraid of anyone and she says what she thinks. Oh, and she can sing. I love her. SERIOUSLY love her. In the beginning, she went unnoticed by Ross for the longest time. But then he started noticing her and things began to shift from this point on. This show is full of happiness, sadness, anger, scandal, betrayal, screaming at the TV, crying, lots of “what the fucks” and “I want to kill..” and “Nooooooo!!! why?!?!”. I could go on and on for days about this show but I don’t want to ruin it for you all lovely readers in case you find yourself looking for a new show to binge watch. I pretty much have Stephanie on speed dial now, blowing her up after every episode. It’s one of those, just when you think it can’t get any worse or even any better, something happens and your brain explodes. This show is beautifully portrayed. For the record, I haven’t read the books and I don’t plan to. I was told the writing style is very 1950’s-esque and after watching the the show (which started airing in 2015 btw) I can’t wrap my mind around 1950’s writing. I’m in the middle of season 3 and I’m practicing patience considering once it’s over, I have to wait… and wait… for Season 4. If you have Amazon Prime US, the first 2 seasons are up there for free. If you’ve not seen this show, does my synopsis make you want to explore it? If you have seen this show, what are your thoughts? Are you caught up? Is there a character in particular you can’t stand? Is there one you want to jump into the TV and hug every single episode? Do you wish you could live in that time and experience what they experienced?? Comment! Let me know everything you think! NOOOOOOOOOOOO!!! I don’t need an obsession with school making irrational demands as it is!! Cause it is really good! It will be your next watch when you get a break from school! haha I totally relate- I really want to reread books, but I decided I was only going to keep that to a minimum this year- it’s really tough! AHH I LOVE THAT YOU’RE OBSESSED WITH THIS!! (oh and Three Musketeers is another show I like! 🙂 ) Hehe yeah Stephanie and I have had a few chats about Poldark too lol. heheh I love your synopsis- totally agree- men are stupid about women 😉 hahahaha oh my goodness your reactions lol!! And yeah I’m not into that writing style either. hehehe and you already know how mad I am at Elizabeth for being totally useless (and brazen to Demelza, even though she literally wanted to run off with her husband in season 2) And I also really love Dwight and Caroline!! Omg Dwight and Caroline 😍😍😍😍!! I thought I was gonna hate Caroline at first but then she bought the bag of oranges and I fell for her. I’m at the point where he’s a prisoner of war and we know he’s alive but Ross is like trying to figure out how to get him back. Meanwhile, George is magistrate and he and Elizabeth went off to some townhouse and left the aunt, the governess and the son home so they’re all like PARTAAAY! And Drake likes the governess. AHHH I KNOW!!! 😍😍😍😍 I totally get what you mean!! I was the same!! And ahh I can’t say anything but I know what you mean (no spoilers 😉 ). And George and Elizabeth are the ultimate ugh couple! hahaha yes!! I love Morwenna!! And Drake!! That’s her name! Morwenna! I couldn’t remmeber it for some reason. I’ll probably finish the season or at least be caught up til they release the rest of the episodes by this weekend. It’s so hard to practice restraint with this show! Yes! Watch! If you like period dramas, you’ll surely love this show! It’s on Amazon Prime if you have it. Great! I have Prime. I’ll fire it up on the Roku as soon as I get caught up on a few others. Woohoo, new period show. Did you ever watch Mercy Street on PBS? I highly recommend that one, too. It’s set in the Civil War era. Downton Abbey is great, too. I still have a couple of seasons left to watch! I cant get the image to load to see the show. I will have to try in a bit. We have several shows in common though so I will have to check back in to see your suggestion. Oh. It’s Poldark! Sorry you can’t see the image.